Hidalgo Early College High School Students participate in a mock investigation of a crime scene. 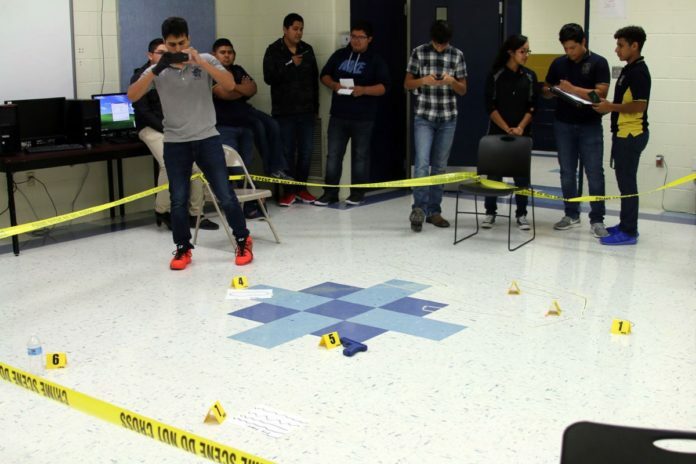 A mock crime scene was set up at Hidalgo Early College High School recently to simulate a real life criminal investigation. As part of a criminal law enforcement class, students went through the steps of how to set up and go through a formal crime scene. Some played the role of police officers, others were a detective, photographer, sketcher and evidence collection among others. Ricardo Herrera, who has a master’s degree and 14 years of experience in law enforcement, wants his students to understand what goes into a crime investigation. Javier Guerra, a sophomore who played the role of the police officer for his group, said he’s excited to learn as much as he can. Guerra plans on attending the University of Texas at Austin and wants to become an attorney. At the end of their assignment, each group came up with their side of what may have happened in the crime scene. Herrera’s goal is to offer his students hands-on experience for their potential career in criminal justice.